After almost 3 years of hard work, two LISTEN modules and online tutorials (BOLTs) are finally up and running and open to the world. What can you do with the stuff we created? Use BOLTs to show students how to research quality information. BOLTs are short and sweet snippets especially geared for student nurses and workforce nurses to learn seeking information and technology for evidence-based nursing practice. However, you will find them also useful and helpful for others who are interested in learning information seeking and technology. Encourage your nursing students or workforce nurses to participate in LISTEN project. There are three ways to do this: face-to-face workshop, online scenario, and online tutorials (BOLTs). 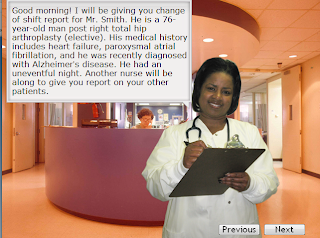 The online scenario includes two MedSurg modules (See image). To participate and get CEU credits, visit LISTEN project website. What librarians said about BOLTs? I just did a quick listen to the How do you .....Database to Use module and it is awesome. The page looks great--nice graphics. And, the content is quite extensive. Very ice job. Wow! The BOLTs are great. Nicely done! This is great! Congratulations to you and your colleagues, and many thanks for sharing with the rest of us. We will happily credit your project as we make use of what you've done. You are welcome to send in your comments and feedback to the LISTEN team.